Our time in the country house in Umbertide, Umbria, is coming to and end. It began in a stressful whirlwind, with Cam’s mum, Deb, set to join us. The girls were mega excited, but the fact we didn’t have her airline, flight times or flight numbers up until the day of her arrival, and the fact that she didn’t know where we were actually staying, doesn’t speak a word of Italian and forgot her Italian phrasebook, all proved a tad problematic and had our anxiety at peak. Once sorted out however, we settled into “Casa Capella” and read with interest potential problems with hornets, scorpions and old-pipe plumbing issues (and yes, we experienced all three). We’re up on Monte Corona, a ten minute drive from Umbertide. The area is a patchwork of leafy tobacco fields, sunflowers (all currently black with their heavy heads drooping in the heat), corn, grapes and silvery olive groves. The house is a second home to an English couple who spend half of their year in Bath, and the other half here in Umbria. There are three stories with precarious, windy stone steps between each level (the girls both have bruises on their legs from falls), three bedrooms and two bathrooms, so the perfect size for all of us. There is an olive grove across the lane, a neighbour’s tree, laden with fresh green figs, and our own little yard sheltered from the sun, fragranced with masses of fresh rosemary and thyme. Location-wise, it has meant we’ve had the chance to explore the many precious hilltowns scattered around Umbria. We’ve done breaky at home (us, tomato with olive oil and oregano on toast, with espressos and the girls yoghurt and fruit then Orzo Bimbo, a kids’ barley drink), packed lunches most days, and headed off with daddy Cam behind the wheel of our poor little Citroen Berlingo. Compared to all of the other precious little towns in the area, most a 20-30 minute drive away, Umbertide is nothing special. Yes, there’s the Fortress in the middle of town, but mostly, this is real Italia, with families going about their everyday life – working in mostly un-tourist related industries, and getting on with things. We had our regular supermarket (Co-Op, but the girls called it “coop”), visited the weekly market (filled with stall after stall of rubbish Made in China imported clothes and kitchen utensils), and used the town’s excellent water machine, which refills your 1.5L water bottle with sparkling or still mineral water from their below-ground water supply for FIVE CENTS a bottle! Also just near us, attached to “our” Abbey, is a little stall that sells local fruit, olive oil, and wine from 3m high plastic vats, which gets pumped into your 5 L refillable plastic bottle with a petrol nozzle for 1.30e p/L! All supplied by the monks. Allelulia! 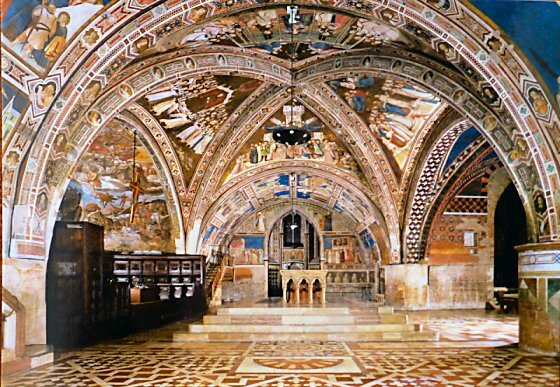 St Francis (San Francesco here) is Italy’s patron saint, and his hometown is like a living shrine kept alive and in pristine condition in his memory. Every building had its stucco exterior removed at the beginning of the 1900s, so that there is a graceful, uniform, unblemished feel to each street. Blemished now only by shop after shop of every type of St Francis memento you could consider, and by thousands of older tourists obediently following their guide’s upheld umbrella. And if you’re wondering where your local nun/priest/friar has got to, I’ll hazard a guess they’re here! Francesco was born in 1181 to a wealthy cloth merchant, and had a fairly fabulous life with money, friends and a military career. He had a life-changing realisation however that there was something bigger planned for him, and when the Cross of St.Damian actually spoke to him saying “Francis, go and repair my church which you see is falling into ruin”, he sold a bunch of his dad’s cloth (who was NOT impressed), and established The Franciscan Program, setting up in a tiny church in the woods, “The Porziuncola”. St Clare of Assisi (who fights for pilgrims’ attentions in the town) started working there, and the Franciscans travelled the world preaching their beliefs of “poverty, chastity and obedience”. We visited St Francis’ tomb, and saw the cross of St Damian now housed in St.Clares church in town. The little Porziuncola is still in tact as well, but instead of being surrounded by a forest, it’s now surrounded by an enormous monstrosity of a church at Santa Maria degli Angeli. Dinner was a place we found WAY up on the mountain behind Assisi at a camping ground! “La Stalla” had a confusing serve yourself ticket system with 4 different coloured tickets that you have to take to 4 different counters to retrieve your meal (set your own table, fetch your own bread etc). BUT it was the cheapest, yummiest home cooked type gear we’ve had. Mains were about 6 euro, and mine was a peasant style polenta/borlotti bean mash that was indescribably good! Known as “Umbria’s Balcony”, Montefalco is perched 472 m above the fields below, and from a walkway which surrounds the town, you get 360 degree views of the Topino and Clitumno valleys, dotted with farmhouses and castle ruins. Only 6000 people live there (I guess they ran out of space on a pointy mountain! ), and the town is quiet and comfortable. The main piazza was hosting a group of local cheese, truffle and olive oil producers, and foodie type shops with home made egg pasta, truffle oils and wild boar salami were a-plenty. We had a delicious lunch at a low-ceilinged Osteria where Deb had gnocchi with a wine sauce made from the region’s famous Sagratino red, and the owner grilled Cam’s meal over hot coals with a smoke half hanging out of his mouth. Delicate work indeed! Apart from food, the only other industry alive and well in the town is linen making, and there were a few shops selling gorgeous heavy linen tea-towels and tableclothes for over 200 euro a pop! Tiny churches were hidden along rows of houses, and Avalon’s interest in the macabre was satisfied with the skeletal remains of two nuns from the 1300s wrapped in their habits and silk socks. A lift takes you up from the car park into the town of Todi,. That unreliable fool, The Internet, promised us a Flea Market the day we visited. Nothing. Nobody. Anywhere. It was a Sunday, so the churches were also closed apart from during Mass. We happened across a small door which led down to a complex underground water system built by the Romans thousands of years ago. My main memories of Todi (apart from the usual fare of stunning buildings, views and food shops), will be stairs, stairs and stairs; avoiding being killed by cars speeding through squeezy streets; and keeping the girls on task with games of “spot the Mary”. I think she peered down at us from about 20 alleyways. These Hilltop towns are giving my oft-consumed gelati a run for its money! “Il paese che muore” or “The dying town” is how this island in a deep valley describes itself. It was once joined by road to Bagnoreggio, but that wore away, and now it has just a wide footbridge to link it to the rest of the world. I cannot believe I had never heard of or seen images of this place before now. Totally amazing. Only a handful of elderly residents still live in Civita because of its isolation. Parts of the town have crumbled into disrepair, with skinny cats wandering through the weeds, but each corner is backed with expansive views of the crumbling valley around it. AMAZING. We have been looking at ceramics shops for the past 2 weeks, determined to take home the perfect plate or bowl that we both like, and that we can have as a reminder of the trip. “Salad? Oh, this thing? We bought it in Umbria daaaaahhhhling”! We searched Deruta, with their avenue of ceramics. A few things we liked, but coughing up over 100 euros wasn’t part of the plan! This was going to be our last hill town, so the search intensified. Elevators up to the town were on the fritz…so it was MORE climbing up, up and up! The town had loads of additions and tweaks in the 12th and 13th centuries, and there was some beautiful masonry on show. The “hanging piazza” was in its day, a feat – with the enormous empty square jutting out from the mountain, supported by carefully engineered stone construction. During the towns Candle Race each year (where the neighbourhoods battle it out…a theme typical of Italian small towns), the square is jam packed with crazed people carrying enormous candle sticks! The town is also St.Francis mad, with statues, rosaries and books aplenty, and tales told of when he tamed The Wolf of Gubbio who had been terrorising the town for years. BUT, back to the ceramics. We found two bowls we liked and after much deliberation, took the chosen piece to the counter. I explained how excited we were we’d found one and couldn’t wait to serve up our first summer BBQ with it back home. “But you can’t put food on this plate”. “Ah, sorry?”. “No, it hasn’t been fired. None of these are for use with food.” WWWHHHHAAAAATTTTT? So if she hadn’t have told me that, I could have keeled over from pottery glaze poisoning, and left paramedics back home flummoxed as to the cause? No signs in ANY of the shops. Apparently some of them are to use, but most to hang up. Like my Nonna might have done. 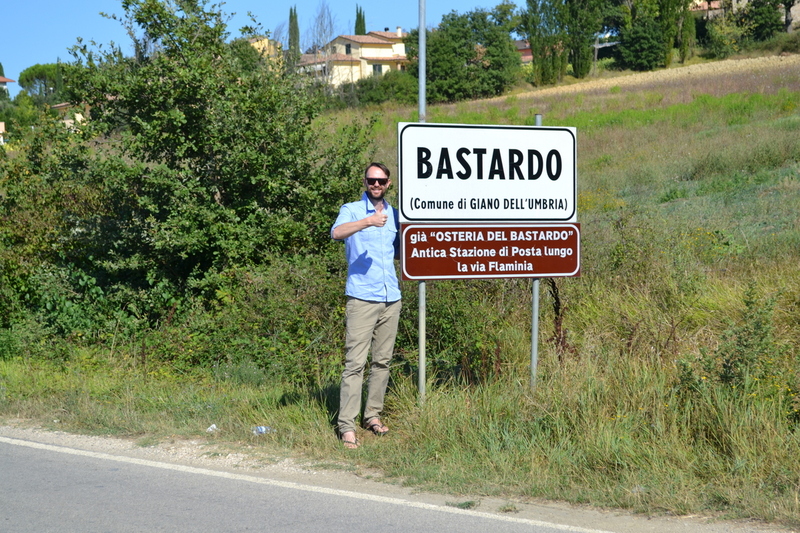 Well, nothing there really, but we HAD to get a photo of the town sign!